Many people put up with the aggravation of a sticking door lock for years. Ironically, by cleaning and oiling them, you can fix most locks in a matter of minutes. Fixing a few stubborn locks might involve disassembling, cleaning, and then reassembling the lock. First, clean the keyhole with a penetrating lubricant like WD-40. (Don’t apply household oil to the key or cylinder because it attracts dirt and eventually would gum up the lock.) Spray the lubricant into the keyhole itself and then spray it on the key. Slide the key in and out of the lock several times to spread the lubricant. With the door open, use a Phillips screwdriver to take out the two connecting screws that are located by the doorknob on the inside of the lock. Remove the two screws that hold the lock faceplate on the edge of the door. Slide the doorknob off the spindle, pull out the lock mechanism, and remove the latchbolt from its hole in the edge of the door. Lay the disassembled lock parts on layers of newspaper or paper towels. Spray a light all-purpose household lubricant or silicone lubricant on all moving parts of the lock, flushing out the latchbolt. Use powdered graphite to lubricate the lock cylinder. Spray until all the dirt is flushed from the assembly and then let the latchbolt assembly lie on the newspaper or towels until all the excess lubricant has dripped off. Insert the latchbolt assembly into its hole in the edge of the door. 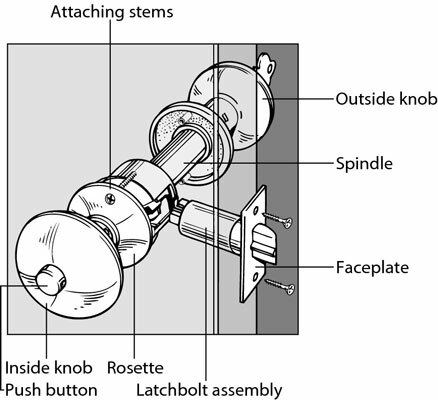 Insert the exterior doorknob and spindle into its hole, aligning it so that the spindles and connecting screws pass through the holes in the latchbolt assembly. Drive in the latchbolt screws, but don’t tighten them until the lock is completely assembled. Slide the interior doorknob onto the shaft, aligning the screw holes, and then drive in the screws. 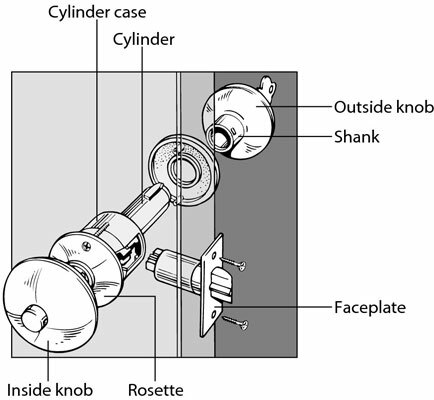 Turn the doorknob back and forth to check that the cylinder and latchbolt are engaged and in proper alignment. Tighten the screws on the latchbolt and recheck the alignment by turning the knob. If you have any parts left over, guess what? You goofed. Disassemble the lock and replace all the pieces. Test the lock by turning the knob and locking the lock. If the lock doesn’t work smoothly, loosen the screws, realign the cylinder and latchbolt, and try again. You can lubricate deadbolts the same way. Remove the connecting screws, the faceplate screws, and then the knobs. Next, pull out the latchbolt assembly and clean and lubricate the lock as just described. To reassemble the lock, reverse the procedure.